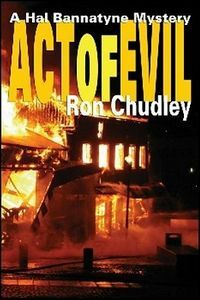 Act of Evil by Ron Chudley, a Mysterious Review. Review: Ron Chudley introduces Canadian actor and amateur sleuth Hal Bannatyne, who is kept busy between roles getting reacquainted with old loves and old friends — but a new mystery — in Act of Evil. Hal has just wrapped up a new movie, filming on location in Victoria, British Columbia, when he decides to take a few days of rest and relaxation. His brother Trent, a former trader on the Toronto Stock Exchange who made a fortune, has moved to the western province and Hal wants to stop in to say Hello. But before he can get away, he runs into an old flame, Mattie, who's in town visiting her father-in-law, Fitz. Soon thereafter, he catches up with a buddy from high school, Vince, a property developer on the island. It isn't long before the threads of these long-lost and new-found relationships begin to tangle — and Hal learns that not everything he sees and hears from them can be trusted. Readers may wonder, when passing the midway point of Act of Evil, exactly where the plot is heading. There are hints of potential crimes to come, and there's a reference to Mattie's son, mysteriously lost at sea several years ago, but nothing seems to be coming of any of it. But give it a chance. The various plot points finally begin to converge, and while there's no "whodunit" to solve per se, indeed, the mystery itself is rather fleeting, the overall result is quite appealing if undemanding. There's a nice balance of character, setting, action and uncertainty as to what's to come, plot-wise, that provides a solid introduction to and foundation for what seems likely to be an interesting series of mysteries. Acknowledgment: TouchWood Editions provided an ARC of Act of Evil for this review.